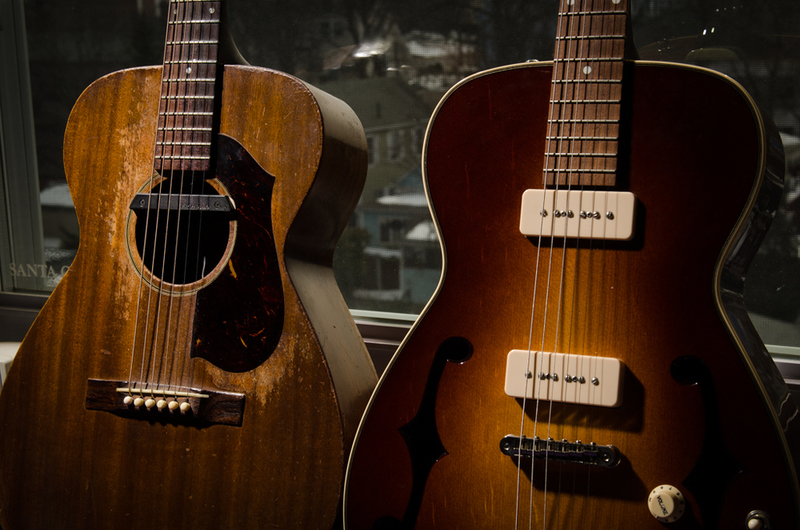 1962 Guild M-20 conversion — Chubbuck Guitars :: making & repairing Guitars in a old building just north of Boston, Mass. Let me premise this post by stating that I am against drastically modifying vintage instruments. I usually do everything I can to restore an instrument back to it's original spec's unless those original spec's hamper playability. The above conversion is a drastic modification. I believe that we as luthier's need to respect the builders of the past and keep their instruments alive for future generations. So while I seem to be a hypocrite right now, let me explain where I'm coming from. In the meantime, here is a little background music. This recording is of the above guitar played by yours truly. Sloppy playing? Yes. But it gives you an idea how the guitar sounds. Below is a photo of the guitar as it came into the shop. Now you know what I mean by a drastic modification. The original M-20 is an all-mahogany flat top steel string acoustic guitar. I do not remember what exactly happened to this guitar, but the bridge is literally being ripped off the top. Here is a closer look at what's going on at the bridge. Wow. I have not seen anything this bad in a long time. The story goes like this, a customer sent this guitar in to have a new replacement top made. Once he realized how expensive a new top was going to cost, along with the finish work and neck reset, he decided that it was not worth it. Also note that this guitar is not terribly valuable - possibly $1,500 in mint condition. This one is far from mint. Please note that monetary value is not always the deciding factor in going forward in a repair. I work on quite a few guitars where the repair costs are well over the value of the guitar. This however, was not going to be one of those guitars. The customer donated the guitar to the shop as he did not want to have it shipped back. So the guitar sat around for a few months. I saw the potential in this broken guitar and wanted to try an experiment. The guitar was destined to be another casualty of war sitting in the corner of the shop collecting dust. I wanted to make it live again. I have always wanted a guitar with P-90's. I also love to practice finish work anytime I can, so a sunburst was in this guitar's future too. Off comes the neck and the top is removed. Below is what the inside of the top looks like. The bridge plate is bent straight through the pin holes and pushed up through the top. Also someone had tried to bondo this thing down with some funky glue. Here's the label on the back. I do not think these repairs will be covered under warranty. Ok, so now the top is off and we can see inside. I want to make this a semi-hollow by installing a mahogany block down the center that still allows the back to vibrate. Let's call this a float-block. I use my saddle slotting jig to rabbet the end blocks. The jig's router guide plate is removed and I use the edge of the cutout as a straightedge for my routing collar to locate against. Here's a close up of the tail block rabbet. Now the neck block's turn. And the close-up of the neck block rabbet. Since I am going electric, I decided to glue in a jack block. This one is Baltic Birch plywood. I like plywood for it's strength to weight ratio in this application. I also glued in a support block for the upper bout strap button. Also take note of the dowel holes in the neck block rabbet. Here's a view of the tail section with the new mahogany center block fit and ready to glue in. The center block is glued in and I radius sanded the rim just for the hell of it. Note that my center block is fairly thick. I will probably go a little thinner if I ever do another one of these again just to save a little weight. In the background is the new top. The new top is a nice piece of bearclaw Sitka spruce with Red spruce laminates on areas outside of the center block. This top was well off-quarter and way too flimsy to use for a traditional steel string acoustic guitar. A perfect top for this float-block. Here we are in the spray booth. I decided to use cream binding and a couple black / maple / black purfles around the top. The back and sides are masked off because I want to keep the character of the 40+ year old finish. And here is the finished guitar. It has a set of Jason Lollar P-90's with a three way switch and master volume and tone. The bridge is a TonePros tuneomatic-style locking bridge and the tailpiece is something I had lying around. It seemed to fit the vibe of the guitar. The fingerboard received new frets and I even swapped out the old pearl fret markers for parchment ones. A new bone nut was cut and I string this guitar with Ernie Ball 12's with an unwound G. The scale length is 24.75", so the heavy strings bring the tension back up to where I like it. I built this guitar in late 2010 and have absolutely fell in love with this thing. Sure you do not have access to the upper frets, but it sounds really sweet where you can grab 'em. Eventually I hope to take this concept forward and build one of my own models with what I have done here. I was reluctant to do this post as I do not want to encourage any of you out there to start ripping the tops off of perfectly good old acoustic guitars. I sincerely hope that I have not offended any diehard Guild M-20 fans out there. I would NEVER do any sort of conversion like this on a rare/valuable or repairable guitar. This one was going to sit around damaged for a long, long time and to me (and the original owner), was not worth the time and money involved to restore back to original. I believe I gave this guitar a respectable second life. I love this guitar. Please feel free to let me know your thoughts. A customer who found out about me from this post recently brought in his 1962 Guild M-20 for some work. And no, I am not converting it. His guitar is absolutely gorgeous and shows decades of playing wear.